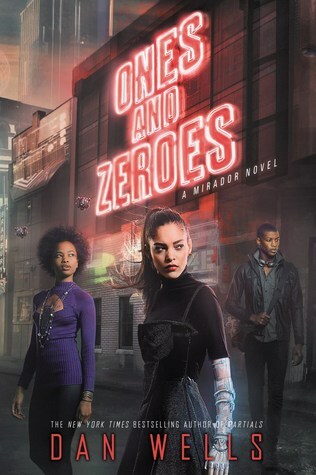 Ones and Zeroes takes place after Bluescreen, Marisa wants to find Grendel and learn more about her accident. For this purpose she will have to enter the network of a multinational, she will meet a hacker who fights for freedom. Marisa is faithful to herself; she plays Overworld with her friends, Anja, Sahara, Fawn and Jaya. She helps her family with the restaurant, even if it becomes complicated for them financially. Marisa is an interesting person, she’s very intelligent, and she’s a pro with computers, like her friends. She’s also very naive at first, she believes in the society despite the fact that it does nothing for the poorest. The Cherry Dogs are a great team; they are friends in real life even if they don’t live in the same country, at least for Fawn and Jaya. A big event will be important for them, for the team and also for their life in general. I love these girls, they are kind and loveable, and they all have defaults and qualities. On the male side of the story we have, Bao who is Marisa’s best friend, he’s here a lot in this book and he is smart too. It’s an important character in the story. We also have Alain, a French freedom fighter, who knows computer and who wants what is best for people. He’s very charming and I like him even if I think that we don’t see him as much as I want. Omar is not so present in Ones and Zeroes, the girls didn’t like him because he betrayed them. It’s not a thing that Anja can forgive easily. I like the part in the Overworld tournament, the competitors are crazy and the girls are awesome at what they do. They aren’t the best team in Overworld but they knew each other and work very well together. Ones and Zeroes was a great reading, the subject is more introduced and the team strengthens themselves amicably, they are stronger together. I really had a great time with this book and cannot wait to read the rest because unfortunately the main things to discover are still not. And then I would very much like that the relationship between Marisa and Alain intensifies a little. Quick word: Dive into tomorrow’s computer world and discover Overworld as you’ve never seen it before. Dan Wells is a thriller and science fiction writer. Born in Utah, he spent his early years reading and writing. He is he author of the Partials series (Partials, Isolation, Fragments, and Ruins), the John Cleaver series (I Am Not a Serial Killer, Mr. Monster, and I Don’t Want To Kill You), and a few others (The Hollow City, A Night of Blacker Darkness, etc). He was a Campbell nomine for best new writer, and has won a Hugo award for his work on the podcast Writing Excuses; the podcast is also a multiple winner of the Parsec Award.